Back when my first farm went bust, I had to scramble to find a second place on the fly. I emailed Anna’s farm knowing that they weren’t looking for help doing anything specific with food but it seemed like a nice place and wasn’t too far from where I was and most importantly I just needed out of a bad situation. But I left the desperation out of my email to not scare off my potential suitor. Anna replied right away that she needs help with the grape harvest and that I could come as soon as I was able. Two days later, I am standing outside the train station in Reggio Emilia looking for Anna. I have no idea what Anna looks like, so I am really looking for someone who’s looking for someone, too. It would have been a good idea to exchange descriptions or at least get the make of Anna’s car. I look at everyone pulling up to the train station wondering if that’s my ride. To be honest, “look” is too mild. What I am actually doing is boring my eyes into everyone. I get a few strange looks back but no one responds to my glare. Anna gave me her mobile number, so after waiting a bit I head to the payphones, insert my phone card and dial her number. I get an error message. Unsurprisingly, I can’t seem to make the phone work. Stupid phone and stupid phone card. (I later find out that I was putting a Milan bus pass into the telephone instead of my phone card. So really, stupid me.) I head back to the main entrance and see a black car pull around with a woman driving it…who looks like she’s looking for someone. Our eyes lock and we exchange a look that says are you looking for me? because I’m looking for you. I smile. She smiles. Relief. I hope she’s nice. She looks nice. She gets out of the car to greet me and she is SO NICE. Such relief. We continue to chat as we throw my bag in the back and we’re off. As she’s driving, Anna asks me why I came to Italy and what I wanted to l learn. I tell her that I came to eat and I came to learn about the food, the language, to have an adventure and to just ‘be’ in Italy. In retrospect, that’s a tall order but it came out of my mouth like it was a short get ‘er done to-do list. About the food, Anna promised to teach me something… a pasta perhaps. But she’s busy, so she doesn’t know when but we’ll make something together before I leave. From my first bad farm experience, I’ve learned to temper expectations. This lady is nice and I’m going to be staying at her nice place (with hopefully less spiders); I can’t ask for anything better at this point thinking of where I just came from. So, even if we don’t make pasta, I’m ok with it (kind of). A couple of weeks later, Anna delivers on her promise. It’s actually the same day we had the amazing cappelletti lunch. Anna is making tortelli for dinner and we’re going to make them together. At this point, I know how amazing a cook Anna is and I’m feeling a bit intimidated by her. Everything she makes is REALLY GOOD and without any effort…or recipe. Spending a few weeks at her farm, I realize that I know way less about cooking than I thought I did. Which is good – I came to Italy to learn and you have to realize you don’t know everything if you’re going to learn something. Now I learn how to make tortelli. 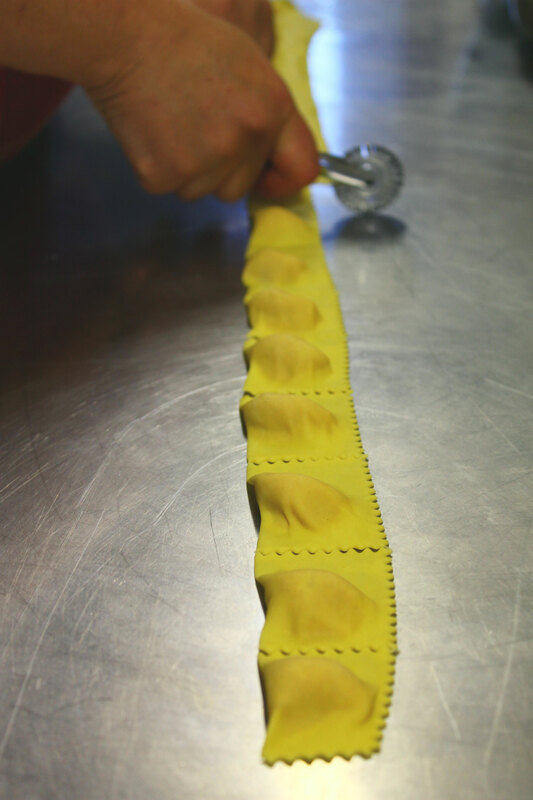 Tortelli, to you and me, are ravioli; they are little stuffed squares of pasta with the ruffle-y edges. 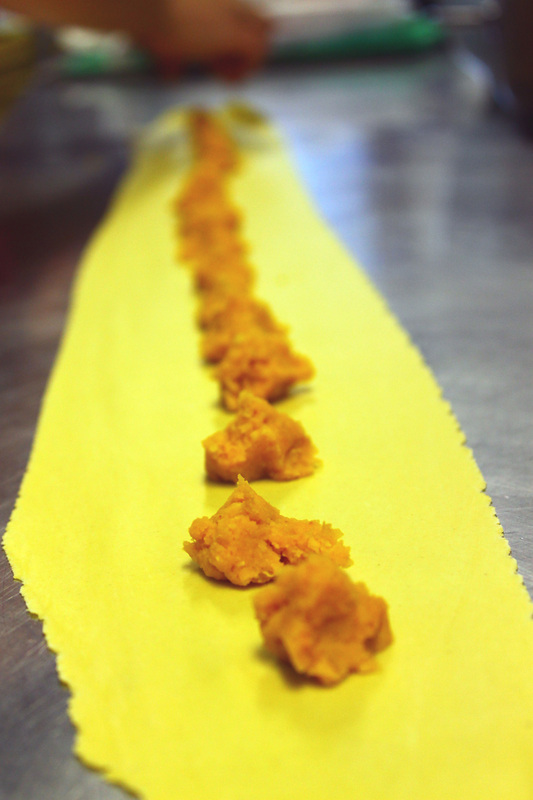 The tortelli we are making are stuffed with zucca (pumpkin). Anna already prepped the stuffing. The zucca was carved up into big pieces (skin on) and roasted in the oven until soft and caramelized. The soft flesh was then scooped away from the skin and mixed together with grated Parmigiano-Reggiano and a few crumbled amaretti cookies (for some texture and sweetness). Yum. So far, so good. Now it’s onto making the pasta. 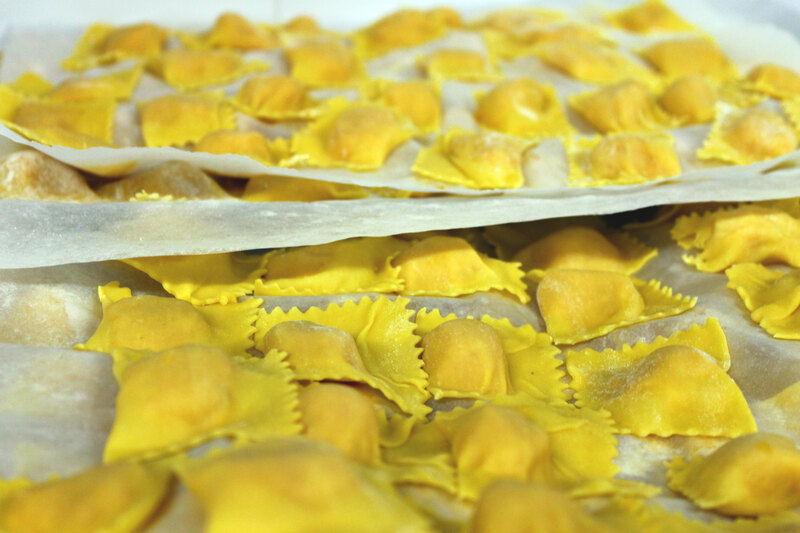 For tortelli, the pasta is made with eggs (not with water). For every egg, you’ll need roughly 100 grams of flour (about 1 cup). Anna uses Tipo 00 flour. But I’ve also seen folks use Grano Duro flour. Anna doesn’t have any chicken eggs so she uses duck eggs from her ducks. Amazing, right? And yes, the eggs are a rich, orange sunset colour; no mellow yellow here. The flour and eggs are plopped into a food processor and whizzed together. As Anna is whizzing the food processor, she’s apologizing for using such a machine. Seriously. We’re making homemade tortelli stuffed with roasted pumpkin on a weeknight. 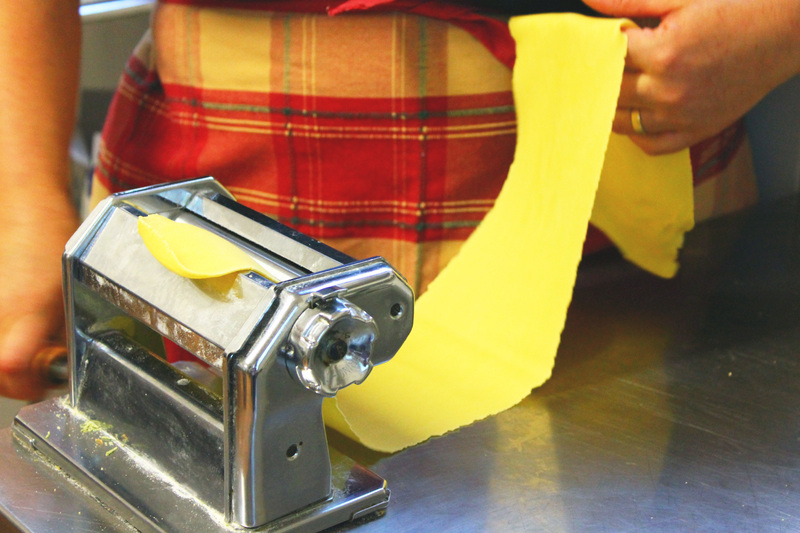 I can only think of attempting to make fresh pasta (even with all the modern conveniences) on a weekend. Once the eggs are incorporated into the flour (the mixture is crumbly), Anna tips the dough out onto a floured counter top to finish it by hand. She kneads it until it becomes a proper dough and has a smooth texture. 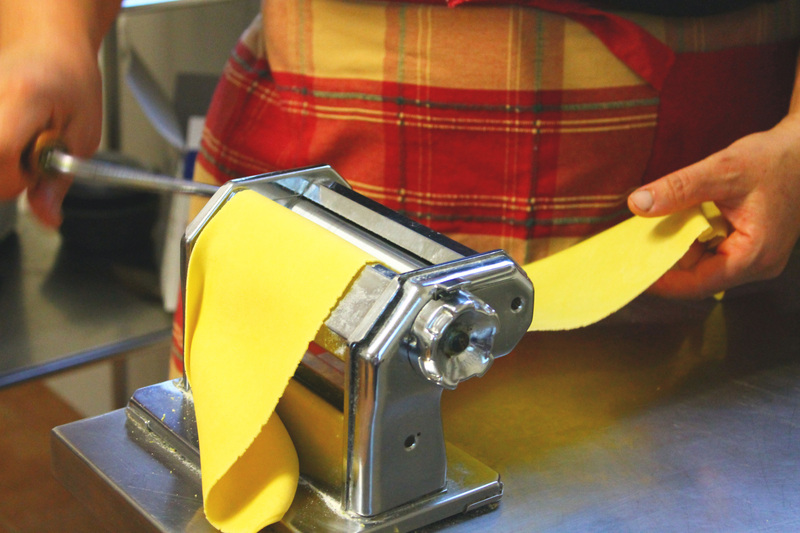 So easy breezy when Anna makes pasta; I’m so full of anxiety when making fresh pasta. 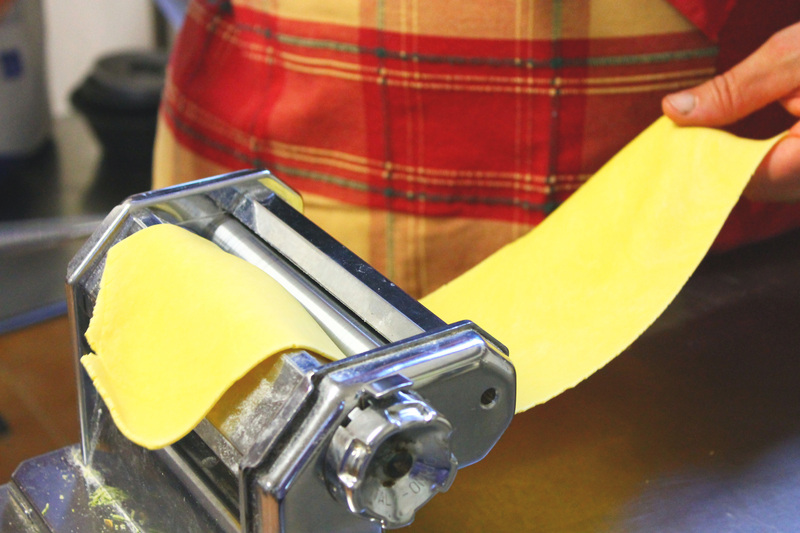 I confess this to Anna – how nervous I am of doing something wrong when making pasta. Anna gives me a look and says, “Ania, you cannot kill someone with pasta.” Right. Next time, I’ll check my anxiety at the kitchen door. Next the pasta dough is cut into pieces that will fit into the hand crank pasta machine. This is another ‘modern’ convenience that Anna is (unnecessarily) apologizing for. She mentions that pasta should be rolled out by hand with a long rolling pin. I don’t see an electrical plug on this thing; this machine is old school enough for me. 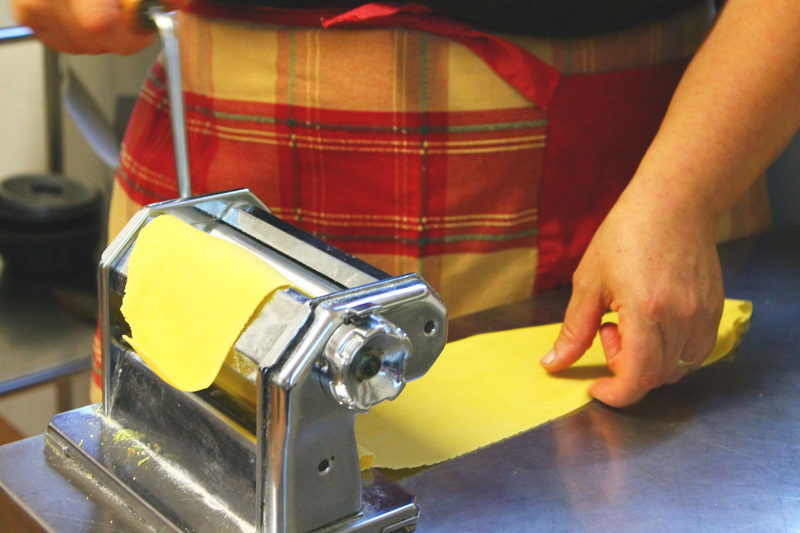 She kneads the cut piece of dough a few more times and starts feeding it through the different settings of the pasta machine – starting from the largest to the second smallest. In between rolling it through each of the larger settings, she folds the piece into three like a letter. Anna tells me that she never uses the very smallest setting because it always rips the pasta. Think of what a tear in a stocking looks like – that’s what happens. Whenever I’ve used my hand crank machine at home, the pasta always tears on the last setting and I thought it was just me. Now, I’ll do as Anna: just put it through the second smallest setting a couple of extra times instead. As each pasta sheet is ready, it’s laid out on the counter and the pumpkin stuffing is spooned onto it, just so apart. I’m working on dropping little spoonfuls of the stuffing onto the pasta at the counter and Anna is at another counter cranking out the pasta. This is when I start hearing on a regular basis, “Ania! Aspetta!” This translates literally as “Ania! Hold on!” Or, figuratively, “Ania! You’re f*%&ing up!” I’m putting too much stuffing down on the pasta. Anna comes over and pinches off a bit from each of the stuffing morsels. The pasta sheet is then folded over the long way so that all the stuffing morsels are covered. I then press down onto the pasta, around each of the stuffing mounds to seal in the pumpkin and to form what will be the tortelli. This is easier said than done and this is where I was having the most trouble. And this is when I hear a lot of “Ania! Aspetta!” When you press down around the stuffing mound, there shouldn’t be any trapped air bubbles. Also, it’s important that the pasta over the mound doesn’t have any creases or overlaps. It should be smoothly draped. You can probably guess from these “don’ts” what my tortelli looked like. Using a ruffled rolling cutter, cut a square around each of the mounds. 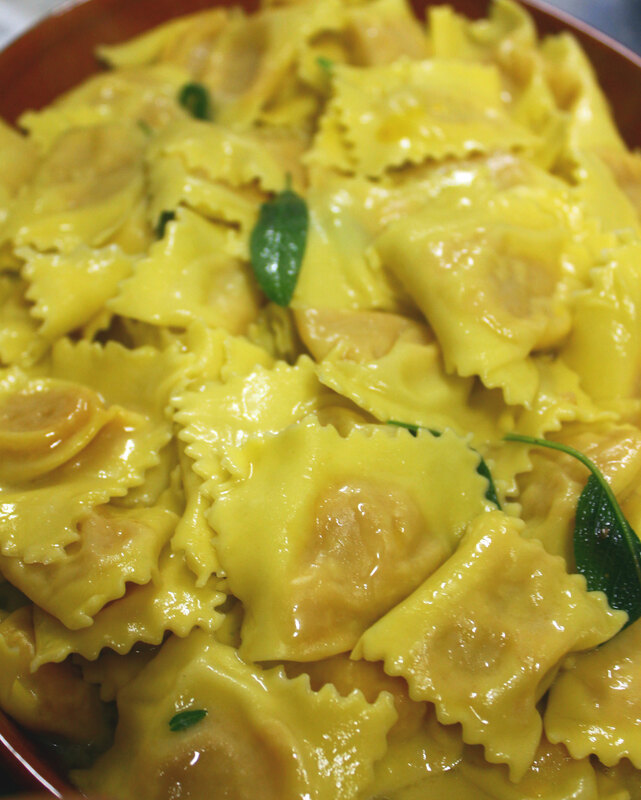 There you go – you have tortelli! These get dropped into salted, boiling water. To be honest, I don’t remember how long these took to cook. But it was quick. I would say about 4 minutes. Anna heats a large pan and drops an enormous piece of butter into it. A bunch of fresh sage leaves are tossed into the butter and oh my the smell of that sage when it hit the butter. When the tortelli are done, they are pulled out of the water, drained and tossed into the melted butter and sage. Dinner – done. But before you take a bite, don’t forget to put some freshly grated Parmigiano-Reggiano on your tortelli. At the table, “Ania! Aspetta!” was replaced with “Ania! Mangia! Mangia!” Don’t need to tell me twice! Ania, I’m absolutely loving your blog! these sound amazing and your story telling is making me cry with laughter! awesome photos and awesome story!!! Cannot wait to hear everything in full detail when you get back. HAHAHAHA – I love the Milan bus pass. You’re not making that up are you? I am laughing out loud. “Ania you can’t kill with pasta” Oooooooooo it’s a classic!!!!!!!!! Hmm. The bus pass, phone card story sounds familiar.